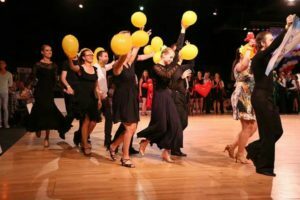 You may or may not have noticed but Team Leidance went to the Studentteammatch last weekend! During the NK (nationals) of the WDC there was a special competition for studentdanceassosiations, and of course SDA Leidance was present. With a team of five couples we went travelled to Assen and represented Leidance during this match. During the competition we were team ‘Yellow’ and we competed against team Red, Blue, Gr een and Pink. Everyone danced their hearts out but unfortunately Team Pink won the teammatch. But as teamcaptain I am pleased to say we became 4th! This means there is lot of room for improvement and I didn’t have to take the oh so awesome but oh so hard to transport troffee with me to Leiden! But of course Nalim couldn’t help but to take a picture with the troffee.. So all in all it was a great experience. A special shout out to Remy & Ilona! Because of a last minute cancellation we were one couple short for the match and Remy & Ilona jumped in and helped us out! Thank you so much!